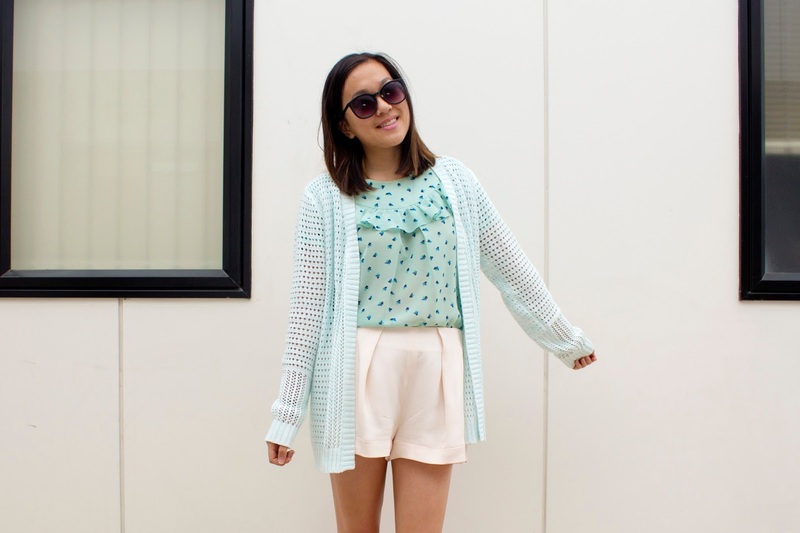 Celebrating summer with a cavity-inducing outfit featuring one of my favourite trends ever: pastels! Don't get me wrong, I love the classic black & white look as much as the next girl, but I can never go past a good baby blue, pale pink or lovely shade of lavender. This Karen Walker top is a thrifted piece that I picked from Recycle Boutique a few weeks ago when I went for a little shop/bagel break with Nicole. It was in amazing condition, and the ruffles were just too cute to pass up. The colour & print also kind of reminds me of mint choc chip ice-cream. I thought it would go nicely with my new pastel green cardigan, which has so many holes in it, I feel like it actually makes you colder when you wear it..